The Milwaukee Area Labor Council (MALC) traces its roots to the late nineteenth century and the affiliation of Milwaukee trade unions to the then newly-formed American Federation of Labor (AFL). As of 2015, 52,000 union members from over 140 Milwaukee locals in Milwaukee, Ozaukee, and Washington counties affiliate under the umbrella of the MALC. Waukesha County has its own council, known as the Waukesha County Labor Council. The MALC is one of the central labor councils in the state affiliated with the Wisconsin State AFL-CIO. From its start in 1887 as part of the American Federation of Labor until its merger in 1958 with the Congress of Industrial Organizations (CIO), the Federated Trades Council (FTC), and thereafter the Milwaukee County Labor Council, sought to promote the interests of workers in their jobs and in the larger community. The FTC and its later incarnations held community organizing drives, festivities and celebrations, and political campaigns for union members and community residents. German cigar makers, typographers, molders, and other skilled tradesmen organized the FTC. Emil Applehagen served as the FTC’s first president. By the end of the nineteenth century, the FTC affiliated with seventy locals with 20,000 members, concentrated among skilled workers and German in ethnic background. At the turn of the twentieth century, the FTC sought to widen its membership, turning to sweatshop workers and recent immigrants, which added thousands to the FTC’s membership rolls. Victor Berger’s Wisconsin Vorwärts served as the FTC’s publication, and the FTC backed Berger’s Social Democratic Party. In 1893, the FTC changed its constitution, which originally prohibited the union from taking political positions, to conform more closely to the Socialist program. By the end of the nineteenth century, socialists dominated the FTC’s executive committee, which also included Berger. Eighteen Social Democratic Party candidates ran for seats in the Wisconsin state legislature between 1904 and 1910, out of which six served as union officials and ten were members. The FTC had to walk a fine line, however, as the national AFL did not support the national Socialist Party. Originally opposed to World War I, the FTC broke with the Socialist Party and worked with the County Council of Defense to support the war. By the mid-1920s, the FTC underwent a transformation. More fully assimilated and able to persuade other political parties to support their causes, Germans within the FTC became less dependent on the Socialist Party. Additionally, the Wisconsin State Federation of Labor (WSFL) turned to non-Socialist politicians, especially Robert La Follette. In the 1930s, the FTC closed its headquarters at Brisbane Hall and stopped providing financial support to the Milwaukee Leader. In the 1930s, organized labor split over strategies for organizing the mass production industries which employed large numbers of unorganized workers. 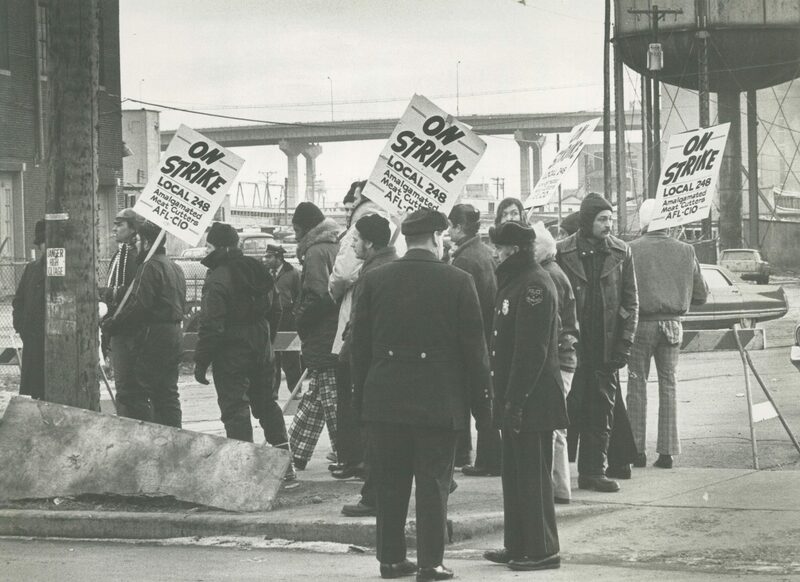 At the national level, the American Federation of Labor continued to support organizing strategies primarily based upon the trade or craft of the worker. Dissidents broke away from this strategy and were expelled from the AFL in August 1936. They organized a new federation, the Congress of Industrial Organizations (CIO), which organized all workers in an industry or plant, regardless of skill level or particular job. These controversies affected the Milwaukee labor council. Local AFL leaders had come to accept industrial unionism and believed that the national AFL would eventually reach a similar conclusion. When the Milwaukee CIO emerged in mid-1936, the FTC allowed the former’s delegates to attend labor council meetings. Likewise, the WSFL elected two CIO leaders to the state union’s executive board. At the July 1936 state convention, the FTC supported the WSFL’s “Wisconsin Plan,” which offered support for unions for unskilled workers. When this plan reached the national AFL convention, craft unionists squashed the effort. With the rise of the CIO, the AFL-affiliated FTC faced organizing difficulties in the 1930s. After the expulsion of the CIO from the national AFL, the WSFL tried to preserve the local alliance between the CIO and AFL, but this failed once the Milwaukee CIO organized an opposition slate to takeover the leadership of the FTC. In the meantime, the two CIO leaders on the WSFL board resigned—one voluntarily and the other forced. Locally, the split played itself out with particular force at Allis-Chalmers. The FTC expelled CIO members from Federal Labor Union 20136, which the AFL formed in 1936 to organize Allis-Chalmers. Following these events, sixty-two locals withdrew from the FTC and created, in 1937, the Milwaukee Industrial Union Council (IUC), or more commonly known as the Milwaukee CIO Council. FLU 20136 changed its name to United Auto Workers Local 248 after joining the CIO. In the 1940s, both the FTC and the Milwaukee CIO Council grew in union membership. In late 1955, the national AFL and CIO merged, forming the AFL-CIO. Subsequently, in 1958, the WSFL and the Wisconsin IUC became the Wisconsin State AFL-CIO. The Milwaukee organizations, the FTC and the IUC, merged in 1959 to form the Milwaukee County Labor Council (MCLC), finally resolving disputes over dues assessments and the number of seats the former rivals would hold in the new council. In the past half century, the council has expanded with the growth of white-collar and service unions, confronted issues of race and local economic development, and most recently battled conservative attacks on trade unionism in the state and region. In the 1960s, for example, when the Milwaukee National Association for the Advancement of Colored People Youth Council began protesting the Eagles Club’s whites-only membership policy in 1966, the MCLC stopped holding its meetings at the venue. In 1993, the MCLC initiated its Campaign for a Sustainable Milwaukee (CSM), which worked with diverse groups to create an industrial development strategy for Milwaukee. During the mid-1990s, the CSM successfully campaigned for a higher minimum wage for workers at firms under contract with the city, county, and school board. In 1996, the CSM created a Workers Rights Board that consisted of leaders from labor, community organizations, and religious institutions that heard complaints from workers. The council of the 21st century includes a variety of affiliated organizations, including community, retiree and religious groups, working to support collective bargaining rights and the political and economic interests of working people in the local area. ^ “Who We Are,” Milwaukee Area Labor Council website accessed February 18, 2015, http://www.milwaukeelabor.org/about_us/, information now available at http://milwaukeelabor.org/who-we-are/, last accessed August 15, 2017. ^ Waukesha County Labor Council website, accessed July 18, 2016. ^ “About Us,” Wisconsin State AFL-CIO website, accessed May 28, 2017. ^ Thomas W. Gavett, Development of the Labor Movement in Milwaukee (Madison, WI: The University of Wisconsin Press, 1965), 77-80, 201. ^ Gavett, Development of the Labor Movement in Milwaukee, 77-80. ^ Sally M. Miller, “Milwaukee: Of Ethnicity and Labor” in Socialism and the Cities, ed. Bruce M. Stave (Port Washington, NY: Kennikat Press, 1975), 44; Robert Lewis Mikkelsen, “Immigrants in Politics: Poles, Germans, and the Social Democratic Party in Milwaukee,” in Labor Migration in the Atlantic Economies: The European and North American Working Classes during the Period of Industrialization, ed. Dirk Hoerder (Westport, CT: Greenwood Press, 1985), 281-282. ^ Eric Fure-Slocum, “Milwaukee Labor and Urban Democracy,” in Perspectives on Milwaukee’s Past, eds. Margo Anderson and Victor Greene (Urbana, IL: University of Illinois Press, 2009), 56. ^ Richard L. Pifer, A City at War: Milwaukee Labor during World War II (Madison, WI: Wisconsin Historical Society Press, 2003), 5-6; Gavett, Development of the Labor Movement in Milwaukee, 92-93; Mikkelsen, “Immigrants in Politics,” 284-285. ^ Eric Fure-Slocum, Contesting the Postwar City: Working-Class and Growth Politics in 1940s Milwaukee (New York, NY: Cambridge University Press, 2013), 66; Gavett, Development of the Labor Movement in Milwaukee, 149. ^ Darryl Holter, “Sources of CIO Success: The New Deal Years in Milwaukee,” Labor History 29, no. 2 (1988): 221-2. ^ Holter, “Sources of CIO Success”: 221. ^ Holter, “Sources of CIO Success”: 222. ^ Pifer, A City at War, 9-10, 116-117. ^ Fure-Slocum, Contesting the Postwar City, 43-44; Holter, “Sources of CIO Success”: 209-212. ^ Gavett, Development of the Labor Movement in Milwaukee, 200-201; John Pomfret, “Labor Council Mergers in State Are Lagging,” The Milwaukee Journal, December 1, 1957, part 2, 15. ^ Patrick D. Jones, The Selma of the North: Civil Rights Insurgency in Milwaukee (Cambridge, MA: Harvard University Press, 2009), 121. ^ Stuart Eimer, “Fighting for Justice beyond the Contract: The Milwaukee County Labor Council and Sustainable Milwaukee,” in Central Labor Councils and the Revival of American Unionism, eds. Immanuel Ness and Stuart Eimer (Armonk, NY: M.E. Sharpe, 2001), 107-108. ^ Eimer, “Fighting for Justice Beyond the Contract,” 108-109. ^ “About Us,” Milwaukee Area Labor Council, AFL-CIO, accessed July 18, 2016. Eimer, Stuart. “Fighting for Justice Beyond the Contract: The Milwaukee County Labor Council and Sustainable Milwaukee.” In Central Labor Councils and the Revival of American Unionism, edited by Immanuel Ness and Stuart Eimer, 102-117. Armonk, NY: M.E. Sharpe, 2001. Fure-Slocum, Eric. “Milwaukee Labor and Urban Democracy.” In Perspectives on Milwaukee’s Past, edited by Margo Anderson and Victor Greene, 48-78. Urbana, IL: University of Illinois Press, 2009. Gavett, Tomas W. Development of the Labor Movement in Milwaukee. Madison, WI: The University of Wisconsin Press, 1965. Holter, Darryl. “Sources of CIO Success: The New Deal Years in Milwaukee.” Labor History 29 (1988): 199-224. Jones, Patrick D. The Selma of the North: Civil Rights Insurgency in Milwaukee. Cambridge, MA: Harvard University Press, 2009. Mikkelsen, Robert Lewis. “Immigrants in Politics: Poles, Germans, and the Social Democratic Party in Milwaukee.” In Labor Migration in the Atlantic Economies: The European and North American Working Classes during the Period of Industrialization, edited by Dirk Hoerder, 277-295. Westport, CT: Greenwood Press, 1985. Miller, Sally M. “Milwaukee: Of Ethnicity and Labor.” In Socialism and the Cities, edited by Bruce M. Stave, 41-71. Port Washington, NY: Kennikat Press, 1975.